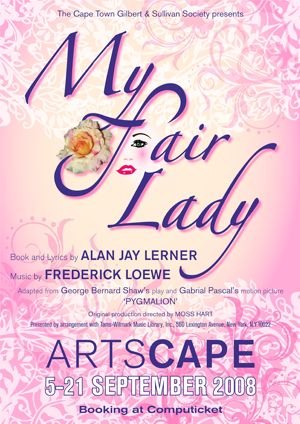 The Society presented Lerner and Loewe’s acclaimed musical MY FAIR LADY at the Artscape Opera House in September 2008. Ralph Lawson directed, with musical direction by Alastair Cockburn and choreography by Kyla Thorburn. Acclaimed designer Dicky Longhurst created a new set and new costumes and the cast were accompanied by the Cape Philharmonic Orchestra in such memorable numbers as as “Wouldn’t it be Loverly”, “The rain in Spain”, “I could have danced all night”, “Get me to the Church on Time”, and “A Little bit of Luck”. Based on Shaw’s PYGMALION, the rags-to-riches tale is of Eliza Doolittle, a poor Cockney flower seller who is transformed into a Duchess by an irascible professor of phonetics, Henry Higgins. It is a popular favourite that has delighted successive generations of theatre-goers since it first opened in 1959. This production is dedicated to the memory of Honorary Life Member, Richard Sharland who died on 3 July 2008. Richard joined the society in 1970, became Treasurer in 1973 and Chairman in 1980. He served as chairman for eight years during which time he initiated our first upward movement from local civic centres to the Baxter Theatre. Since then, although no longer on the Committee, he has remained involved in many important aspects of the Society’s activities, with a special emphasis on set design and construction. For this production of My Fair Lady, Richard build the models of the sets and created the working drawings. We will miss his talents as a craftsman, a technician, a calm and reasoned advisor and a good friend.